Niagara Falls, NY - Lina Voutour rolls a ball with the back of her hands for exercise. 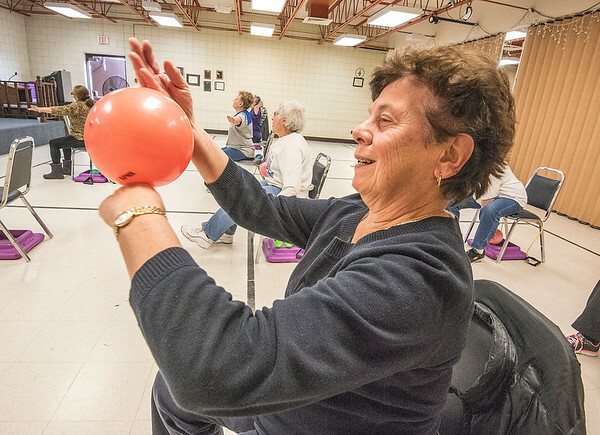 Seniors at the John Duke Senior Center take part in the Silver Sneakers exercise program under the guidance of Group Fitness Instructor Angela Vizzi from Forever Fabulous Fitness in North Tonawanda. Silver Sneakers meets every Tues 9:30 a.m. - 10:30 a.m. and on Thursday from 10 a.m. - 11 a.m.